Every morning at breakfast, Michael reads from this Billy Graham book we have on our dining room table, it's like a little devotional book. I've been so busy lately, I didn't realize that June 16th was coming up until I was flipping through the pages of that book, this morning. When I turned to today's page, it hit me. 17 years today, Michael broke his neck. He was 17 when it happened. So, today, he's been paralyzed for half of his life. You'd think it would be like this big day you would see coming. I have no idea how you'd mark an anniversary like that. A couple of years ago, when it was 15 years, I sent him a card. Last year, I cried to myself, just a little bit, not so happily wishing this third person in our marriage, his disability, a "Happy Birthday." This morning, we didn't do anything, except to talk (very briefly) about it, over breakfast. Some days it's not a big deal. Some days, it's the worst thing in the world. 17 years ago today, my heart breaks for what that little teenage guy and his sweet family were going through. I can't even imagine. But, boy am I glad my Michael pushed and pushed and went through all he went through to become the amazing man and husband that he is today. I sure do love him! I cannot BELIEVE it's been 17 years?! Oh my goodness. I remember so well when it happened. Our hearts broke for Michael. My kids adored him, thought he was the coolest. Then he also became their hero. He's still mine! Your sweet hubby is an inspiration to ALL of us! Would you give him a big hug for me tonight? Love you guys! Wow! 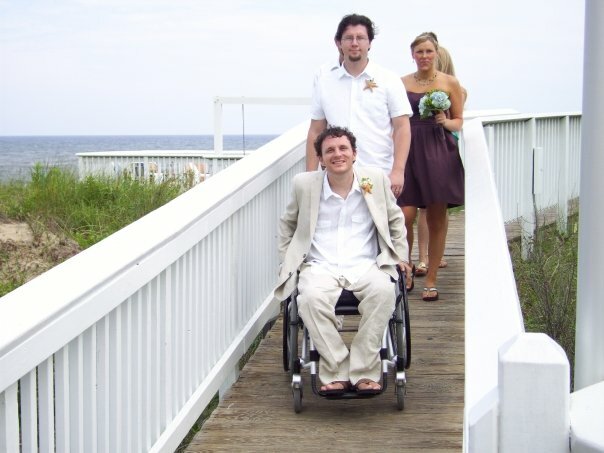 I've only ever known Mike before the wheelchair. That seems crazy. And means it's been a really long time since I've seen you in person! But Diane's right. Mike was the coolest, kindest guy--even in highschool (where it's almost impossible to find THAT combination!) I remember thinking when I heard about the accident that it seemed so unfair. Why the nicest guy in the whole school? I still wonder. But I do know God see how blessed in spite of the pain. And I know He has good things in store for you both, maybe even because of it. Seventeen years my hero has inspired me, you and many others along the way... Love you son! Seventeen years ago LaDonna called Mom and told her. At first I thought it was my cousin Michael, but she said no. It wasn't real at first, my mind would not accept it. Then I opened my billfold for something and there in my pictures was one of Michael smiling at me. That smile said in a sense, "yes, Aunt Linda, it really happened. This is real. But with God on my side I will handle it". Yes, then it became real. I cried, I screamed, I guess it was denial. Now Mike has turned this entire episode into a story of faith, strength and courage. I am so very proud of him. He is still my baby and always will be, but my baby is, I am proud to say, a wonderful young man who is an inspiration to us all. And yes, Mike, I still cry sometimes. Part of the tears are of pride, I do love you. Oh my goodness.I love this post. You almost made me cry. I think about Michail's accident, and how that day to me has become a celebration of his life. I can't imagine what his family was going through, much less him. He too has been a trooper. What awesome men we have! I didn't realize it had been that long ago. I remember when it happened and our church prayed for the Ritter family. I can't imagine what Michael and his family went through behind closed doors. But God has been faithful to him and he has been faithful to God. What an inspiration Michael is to so many people! And now Dana because of your love and selflessness that you have for Micheal, you too my dear are an inspiration. I am so blessed to know both of you! You two need to write a book. I know it would touch so many more lives than you already touch. May God bless you beyond belief, give you peace, strength, unconditional love for one another, and a joy that will be everlasting. Love you guys!